Over this series, we explored various aspects of the Good News of Jesus—things that we learn from Jesus’ words and actions in the four Gospels. 1. We learned that God is not angry and harsh with us as many of us thought. Instead, he loves us fully and freely and desires our happiness and reconciliation. 2. We learned that, because of God’s love, we need no longer carry heavy burdens of fear, guilt, or self-condemnation. If God finds us worthy of love, then we can love ourselves. 3. We learned that we should focus on loving and caring for people rather than keeping burdensome religious rules. Once we understand God’s loves for us, we begin to love ourselves and are in a much better position to love others as we love ourselves. 4. We learned that as believers we become agents for expanding God’s kingdom on earth by growing as individuals, loving people, and sharing the Good News with others in relationship. 5. Finally, we learned that when our life here is over we have a resurrection life of peace and happiness that lasts forever. This Good News is so wonderful that we have difficulty grasping it all, and it is no wonder that we want to share it with others who are ready to listen. But there are some believers who somehow misunderstand the Good News at every point, so that it sounds more like bad news. By missing a few key truths, many believers try to please God by twisting the Good News into something negative and horrible. Living as a believer then becomes so burdensome that, instead of joy and freedom, it is hard and oppressive. I know—I have been there! These believers are not evil. They genuinely believe these things—in part because of the way they read the Bible. To them every part of the Bible demonstrates God’s wrath and his demands on how we must please him. So, over the centuries, they developed harsh, misguided doctrines that control them. It boils down to two points: to please God we must A) believe the right doctrines and B) follow God’s many religious rules and requirements. When reading the Old Testament, assuming that God revealed its contents rather than it being written by humans from their limited ideas of God, they become convinced that God is indeed angry, violent, and vindictive. A deadly worldwide flood; mass genocide in the conquest of Canaan; quick retribution and death for those who disobey—this seems like a very angry god. But this is only how Old Testament writers thought of God. Our real insight to what God is like comes from Jesus, which is nothing like the Old Testament sometimes describes. Many believe God is totally alienated from us! He cannot even look upon our sorry, sinful selves. 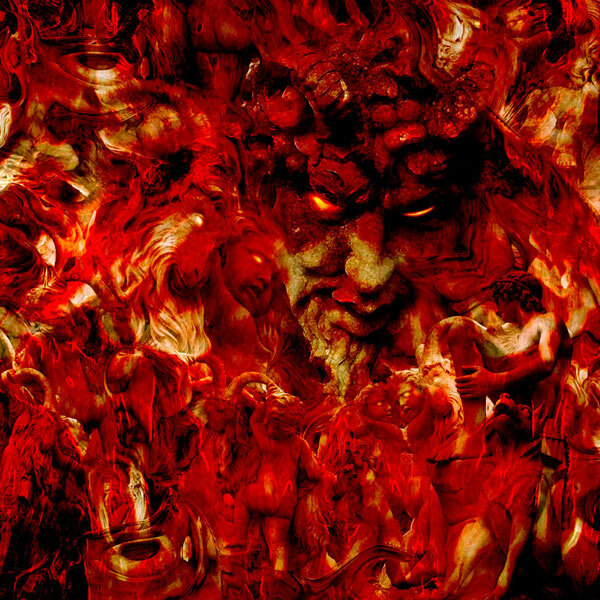 We are nothing but worms in his sight—only good for destruction and eventual punishment in the eternal flames of hell. This creates for us, in addition to the baggage of fearing God’s anger, the further baggage of seeing ourselves as pitiful, worthless, and unlovable. This is opposite what Jesus says of the Father who wants all of us to be reconciled to him. God is not alienated from us, but we feel alienated from him because we don’t understand that we are both lovable and valuable to the Father. Many believers think that because God is picky and jealous we must try to placate him by keeping innumerable rules he requires of us. If we do not satisfy his requirements we are again in danger of hell fire. This becomes a burden because we never know for sure if we are keeping the rules to God’s satisfaction; and those convinced that they are keeping the rules can become self-righteous and tend to judge other people. This attitude alienates people further from God. Many who embrace these views also believe we must share Jesus with everyone. However, rather than sharing the genuine Good News with those who are ready to hear it, they often confront people with the message that they are sinful, displeasing to God, and on their way to hell. Only when the person acknowledges this can they ask forgiveness for their sins, accept Jesus in their heart or life, say the sinner’s prayer, and begin to believe the right doctrines and keep God’s rules. Those who accept this message then take up the burdens from which Jesus wishes to free us. Those who reject the message often leave the encounter with a very negative view of Jesus, the Good News, and the church. On the one hand, some such believers fear they are not doing enough to please God, or that they will do something to fall from grace and ultimately go to hell anyway. On the other hand those who are convinced they are successful in pleasing God think they are God’s chosen and that heaven is a sure shot for them. They can become quite arrogant and condescending toward other people. The whole goal of going to heaven instead of hell dominates believers to the point that the rich aspects of the Good News in our current life are not evident or are inconsequential. The point of the Christian life becomes avoiding hell. The Good News of Jesus brings joy, happiness, purpose, growth, peace, and reconciliation. 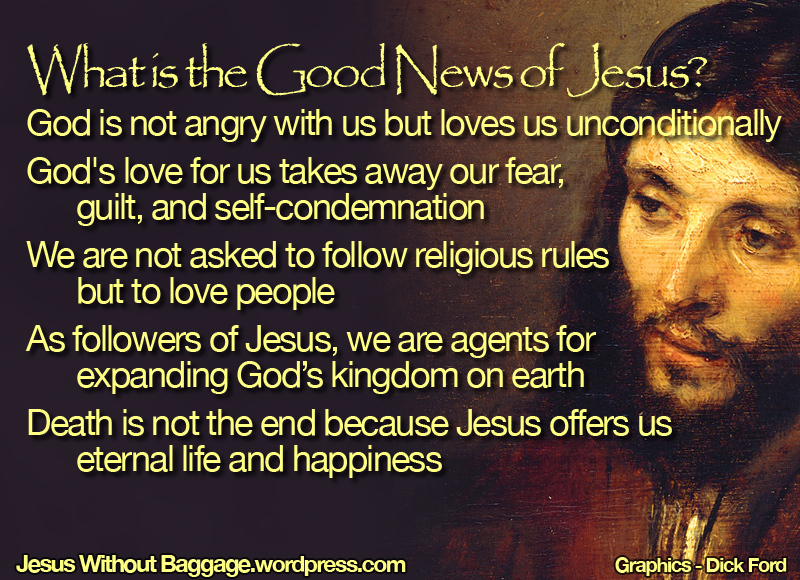 The bad news message brings great burdens, poor self-image, insecurity, narrowness, judgmentalism, and the alienation of those who might otherwise be interested in the Good News. Those who believe or teach the bad news are not evil—they are simply misled and trapped in a rigid, restrictive system. What they need is freedom—freedom from burdens; they need the Good News of Jesus. These believers are among those whom we are called upon to love even as we love ourselves. Even though they claim Jesus, they are in need of Jesus’ message of love and reconciliation. Those of us who better understand the Good News can help those trapped in bad news — but not by badgering them. We can help by sharing Good News concepts and by assisting those who have begun to question the validity of the bad news they have been taught. Let us be observant to such opportunities. This entry was posted in alienation, eternal life, God, hell, Jesus, legalism, love, sin, The Father and tagged angry God, heaven, religious rules. Bookmark the permalink. This post nails it. What good is it to take a burden off, if you are the one who placed it there in the first place? Thanks Fidd, and I agree: why would Jesus offer to relieve burdens he has placed there himself? An excellent and revealing question. So, I just was able to read this today, Wednesday. Today’s gospel reading in the Church is the one where Jesus tells his followers to confront someone face to face if there is an offense. Then, take witnesses, and finally to the Church. If the person doesn’t respond, he gets kicked out of the Church & is like a “tax collector or Gentile”. This is in direct opposition to the command to love others as yourself and forgive seventy times seven. I’m confused. Sheila, there is also a piece in the Bible about you being blessed when they exclude you and say bad things about you. Perhaps a contrast between the words attributed to Jesus and those attributed to Paul: the former being for the benefit of individuals and the latter for the benefit of the church authorities! There are some conservatives who follow this passage as a legalistic procedure for church discipline, which I think is too literalistic, but the passage is one of moderation–it opposes slandering a member or condemning them instead of providing a way of reconciliation. I don’t know what this passage has in mind in using the word ‘sins’, but I don’t think it refers to flaws and lapses that we all have, nor does it involve differences of understanding such as doctrines. Instead something more serious is in view. Taking an example from recent headlines let us consider sexual abuse. If a member, perhaps even a church leader, is sexually abusing others this is something that must be addressed! The procedure outlined above is much preferred over summary condemnation. If the offending members continues to be recalcitrant and does not respond appropriately, then they are treated as a pagan or a tax collector; in other words, they are no longer considered a representative of the church. But how would Jesus treat a pagan or a tax collector? We have examples of his interaction with both in the Gospels, and his responses were of love and concern. So I don’t think such a person is shunned or becomes a pariah; they are simply not considered part of the church, which is no different from anyone else who is not part of the church. I expect such a person would be eligible for re-admittance were their situation to change. That make sense. It was to Matthew 18 that I was referring. It seemed a contradiction with Jesus’ acceptance of tax collectors, with whom he dined. My surgery is tomorrow, by the way. I will be thinking of you tomorrow. I hope your surgery is an easy and successful one. Tim, shouldn’t an abuser just be reported to the police? They seem a more appropriate authority. Yes, of course you are right. This would be the appropriate response in our society. I used the example primarily to demonstrate a more serious situation than that which requires more simple approaches. A better example, also from recent headlines, might be abuse of power by church leaders or personal use of church funds; there is no easy police resolution for those. If the writers of the OT were writing about their understanding of God and not the revelations they received from God, where did they even get the idea that there was a God in the first place? I’m a former evangelical, just trying to understand a more progressive view of scripture. Thanks! epic, it is fairly clear that the first ideas about God expressed in the OT (i.e. Yahweh and El) were just ‘gods’ like Baal and Asherah. We can see this in the way that they assumed that Yahweh/El was limited in knowledge, as they quoted him as saying things such as ‘I thought that you would do so and so, but you didn’t.’ To outdo the claims that were being made about the gods of the surrounding nations, the Hebrews eventually made the claim that their God was all powerful, although they still assumed that He would sometimes be angry, or behave in a capricious manner. So you think they just made up a God to explain the world and their existence? Initially, yes. Without any other basis to explain it, then a deity with much greater powers than themselves was a reasonable idea. Disasters, caused by the weather and the other manifestations of destruction in the world, befell them, so they would quite naturally think that they had offended this deity in some way. Seeking to appease this deity led some of them to think that they knew the answers, so they would persuade other people to begin to perform various rituals. Hence religion began, not only in Palestine, but in many other parts of the world. The thing that set the Hebrews apart was to dare to believe that their God was all-powerful. …Those living a low or inferior standard or quality, as they lack sufficient money to live at a standard considered comfortable or normal in a society. If, this is the ONLY definition then, EVERYONE IS POOR in a SOCIETY! Not as an Individual YOU, as the Society is with people, who are from different walks of life and with different blessing LEVELS, either by their virtue or virtue of their parents. We are humans, with a MAXIMUM of limited knowledge and memory, that too got after reading, and not revelations. We are now having reached a maximum capacity of 6-10 TeraBytes of hard disk in a compact size, but imagine when the computer was invented, hope you all remember, they were the size of a large room? In same perspective, could your tiny brain imagine the capacity of God’s memory, who has the RAW DATA from of Adam to the child who will be born in next century?! So, Are you saying that that Charles Babbage, who first originated the concept of a computer is like those, first ideas about God expressed in the OT, then later people IBM, took it to different levels, but…No! But now, we the 21st century techno savvy people, who are not able to understand the original meaning of GOD, we know only to USE & THROW, let it be relationship or God, then later suffer for entire life and blame the universe or find someone as a scapegoat. WE CANNOT MAKE GOD, only GOD CAN MAKE US! though we have created 21st century gods like, EMI, EGO, e.t.c… very similarly, for a farmer it will rain, as God, trying to worship these illusion God, to satisfy their SENSES. But, NO ONE CARRIES their possession when they die, NOT EVEN Alexander the great, who conquered most of the world of his time! epic, your question, and my initial response to it, led me to think more about the events that might have led Judah to believe that their god was all powerful. We can dismiss the activities of David and Solomon, and those that went before in the OT, because there is no independent evidence for a state of Israel ‘stretching from Dan to Bersheba,’ as there is no record of the activities of such a state in the available Assyrian or Egyptian records, and the available archaeological evidence shows that Jerusalem was merely a small hill town in about 1000 BC. The most likely event would have been the relieving of the siege of Jerusalem by the Assyrians under Sennacherib (the Assyrian records confirm that this siege occurred), particularly as it came only some 20-30 years after the successful siege of Sameria by Tigleth-Pileser III, the Assyrian king of the time (this is also in the Assyrian records). Good question Epic. I think the Old Testament writers wrote about how they thought of God rather than receiving direct revelations from God. As a result, they depicted him as a warrior God who helped defeat their enemies–as long as they kept his requirements. This caused them to think of God as jealous, angry, vindictive because if they suffered reverses it must be because he was punishing them. However, the later prophets began to see God as the friend of the poor and disadvantaged who punished kings who took advantage of them. Our real picture of God comes from the words and actions of Jesus who describes God as a loving father who loves us and wishes to bring peace and reconciliation to all of us. It is Jesus who shares with us the real nature of the Father. Too many believers try to reconcile the misguided views of God from some Old Testament writers with Jesus’ depiction of God, so they end up with an angry, vindictive God as well. I am still an evangelical, though I am theologically progressive. So do you believe there is any value at all for a Christian in the OT? Did it foretell the coming of Christ? And how do you know Jesus was the son of God if the OT isn’t truly written by God? Thanks! Yes, Epic, I think there is value in parts of the Old Testament. Some thinkers really grappled with difficult ideas of God and life, such as Job and some of the other Wisdom writers. And the later prophets seemed to really understand the true heart of God who was concerned with the poor and the marginalized instead of legalism and ritual. However, I don’t think the OT really foretold the coming of Jesus, though some NT writers were fond of using passages from the OT that reminded them of Jesus. I believe Jesus was the son of God because I think the words and actions of Jesus, written from the memories of his earliest followers, are generally trustworthy reports of those who were impacted by Jesus. I understand, but then you have to ask the question of why God waited so long to reveal himself to mankind in the person of Jesus? What do you make of the epistles? The teachings of Paul and Revelations? Are the Gospels really the only trustworthy books in the Bible in your opinion? In response to epic’s post of 19 August, one of the reasons for God’s timing for the birth of Jesus was the status of the Roman state/empire at the time and in the coming future, which was important to the spread of Christianity. For me, the epistles are about control of the church, whereas the Gospels are more focused on our personal relationship with God. ‘Revelation’ is an attempt to put together some of the disparate ‘prophecies’ of the OT. All books in the Bible provide the writer’s understanding of God, taking into account the other scriptures/writings with which they were familiar. Hi Epic, I don’t know why the timing of Jesus’ appearance was what it was. Perhaps we weren’t ready before that, or maybe it was the optimum time for the message to spread, as Chas says. It could also be that the Jewish people were building toward destruction, which Jesus warned them about and which happened only forty years or so after Jesus; he saved a considerable remnant, as the Christians did not participate in the war and were safe–and by then the message was spreading fast among the gentiles. In regard to your question about the other books in the NT, I think they are very valuable as a group. Even though they are not inerrant, they give us a picture of how the early believers thought and how the church grew, and they also provide some very good counsel of how to live as a believer. I admire Paul tremendously. Although he spoke to another time, was limited, and also bound to some extent by his culture, his insight into what it means to be a believer is powerful. I believe if he were writing today he would speak to our time instead of the situation 2000 years ago. James is excellent and there are other wonderful books. I do think it unfortunate that the book of Revelation was included in our collection because it was written to a specific crisis for a specific in a genre that people understood then but that most people no longer understand. So we try to derive truth and direction from it that has nothing to do with what the author had in mind. The tiny book of Jude is an unnecessary book and has a number of real problems with its sources. I do not suggest people try to find value in Jude. Basically, the NT books are trustworthy to the extent that they were written from the hearts of early believers who were strongly impacted by the message of Jesus. Surely the most convincing evidence that Jesus was the Son of God is in the NT. I don’t see how you could be convinced of that from something in the OT if you had not already seen it in the NT. Jesus is really seen only in the OT by back-interpretation. Sorry, I missed the boat! Can someone tell me, “How Jesus is ONLY Son of God, and we all are NOT HIS Children”. Evidence: Adam and Eve were our Fore-parents created by our GOD, and we all are their descendants and legally we all are Children of God, Any supporters? Adam and Eve are part of a fable written by a person’s experiences in contemplating the nature of humanity and God. They aren’t real people. Read “Genesis For Normal People”. I think its author is Peter Enns. Regards. If you interested, In India we have Vedas, Ramanayam, Mahabharatha…These are epics. Very soon I will be publishing the evidences on Bible, but before that, Can you science create one living cell? Not sure what you’re asking. I’m not an atheist. What I meant was there are many epics but ONE GOD’s WORD, BIBLE. Now I understand your comment, but I don’t follow a literal reading of the Bible. We need to read Bible, with open heart, no assumptions. And discuss only with God, He will make us understand the meaning, just try once. NO DISTURBANCE! I agree Sheila, I don’t accept everything in the Bible as ‘God’s word’ either. As we mature as believers, we must read the Bible in a more informed way realizing that it was written by humans. It’s such a relief to have come across your blog. I have been wrestling with lots of issues due to biblical interpretation – either by me or others. Hi Little Sheep! Welcome to Jesus without Baggage. I am glad you like the blog and hope it continues to be helpful to you.